A stone sculpture carved in the full round with some parts broken off shows an aged female possibly wearing a skirt. The knots of the belt are visible on the right side. Additionally she wears a sash tied around the breast and knotted on her back. Her headdress consists of a cap hold together by a knotted cord. 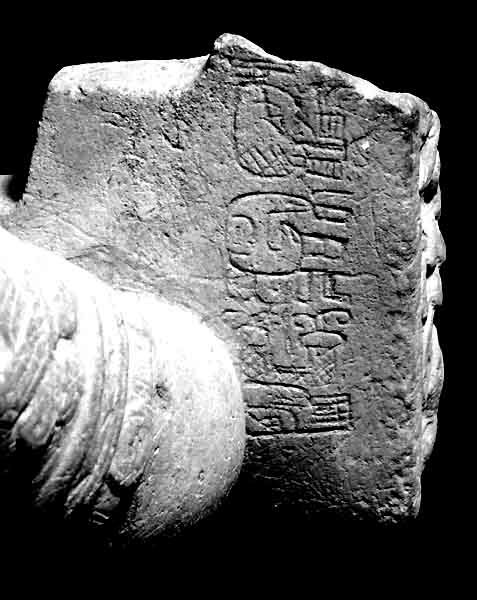 It has jaguar ears attached on the sides and an object on the top of the cap unidentifiable on the photograph. Instead of human eyes she has bulbous ones, which are characteristic for supernatural beings. Showing three dots instead of pupils and iris, each eye resembles the glyph for hix. The mouth is open, the tongue or a frontal tooth is exposed (not visible on the Photo if tongue or tooth). The design on the chin not recognizable either. Simple earplugs make up her ear ornaments. The woman kneels with her legs spread over the stepped cleft of a mountain. The mountain is clearly represented by the witz monster carved in low relief on the bottom front edge of a rectangular frame. On the photograph is is not clearly visible if the large rounded hole is artificial or a natural cavity as on for example several early monuments at Tikal (e.g. Stela 39). The details on the side edges on the frame are not exactly identifiable on the photograph. Although both arms are broken of it is still visible that they were attached to the now broken off upper side parts of the rectangular frame as if the woman was proping herself on it. The iconography discussed before allow a clear identification of the figure as a portrait of a female deity, designated by Paul Schellhas as Goddess 0 (Schellhas 1897, 1904, Taube 1992:99 ), the goddess of weaving and childbirth and the patron deity of midwives. Various depictions of this goddess on Late Classic painted ceramics like t he Birth Vase or the Codices show the same characteristic features: aged face, jaguar ears on a caplike headdress hold by a knotted band or snake, hix eyes, skirt. Several midwives dressed as Goddess 0 on the so called Birth Vase (Kerr 5113) (Taube 1994: 650) assist a woman standing on top of a clefted mountain giving birth. The latter woman wears a sash around her upper stomach to constrict the abdomen at birth. Although the age of the woman represented and the fact that she is far beyond the reproductive age, she is clearly shown in a position of giving birth, even wearing the sash around her stomach. Obviously she mimicks this act, thus her portrait making reference to her role as goddess of childbirth. The small size of the sculpture (height 25 cm) may hint to its use as an idol in a domestic shrine, perhaps by the wife of a ruler. Later the sculpture perhaps found its final location in the tomb of such a royal woman. The style of the sculpture indicates a date between the Early and Middle Classic and therefore this piece is the earliest representation of Goddess 0 known so far. 1897 Die G6ttergestalten der Mayahandschriften. Ein mythologisches Kulturbild aus dem alten Amerika. Berlin: Verlag von Richard Bertling. 1904 Representation of Deities of the Maya Manuscripts. Papers of the Peabody Museum of American Archaeology and Ethnology, 4 (1). Cambridge, Massachusetts: Harvard University. 1992 The Major Gods of Ancient Yucatan. Studies in Precolumbian Art and Archaeology, 32, Washington, D.C.: Dumbarton Oaks Research Library and Collections.